Falling prices and increasing performance of embedded systems and sensors, as well as the support of industry allow students nowadays to implement their project ideas. 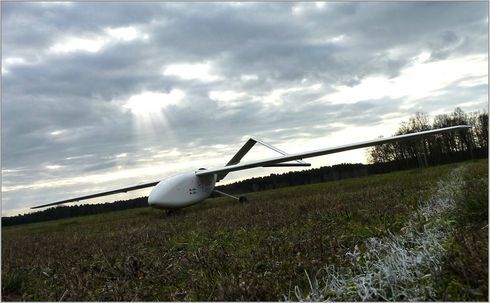 The Institute of Aeronautics and Astronautics at the Berlin Institute for Technology enable students to join forces in the IFSys project (Intelligent Flying System) to develop an UAS (Unmanned Aerial System). The project offers students with different backgrounds the opportunity to apply and deepen in practice the knowledge gathered in lectures. They are supervised by the Chair of Flight Mechanics, Flight Control and Aeroelasticity Prof. Robert Luckner and by the research assistants Georg Walde and Arndt Hoffmann. The students work for the project either in their spare time or in the framework of their final thesis. A wide range of tasks is offered, ranging from aircraft-related topics such as flight mechanics, flight control, and lightweight construction to electronics, information technology, electrical engineering, project management, public relations and marketing. 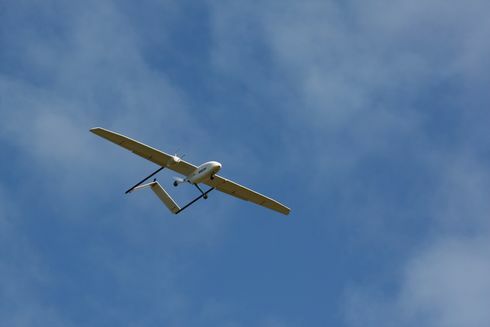 The project objective is to design and operate an UAV (Unmanned Aerial Vehicle), which is the airborne part of the UAS. The UAV will be able to automatically take-off, fly trajectories and finally land. A typical task between take-off and landing is to fly a search pattern at an altitude between 70 and 100 m for 20 minutes at a speed of 20 m/s. Based on the defined mission and the resulting requirements for the aircraft, the students designed the prototype aircraft ALEXIS (Airborne Laboratory for EXperiments on Inflight Systems). ALEXIS is a pusher propeller-powered airplane with two tail booms and an inverted V-tail. The span is 4 m; the take-off weight is about 11 kg without payload. A payload of one kilogram, for example a camera, is intended. ALEXIS is powered by a 1.5 kW electric motor. The chosen configuration allows a largely separated integration of the flight control system into the fuselage nose, remote control system and actuators in wing and empennage, and the engine in the rear of the fuselage. Due to the large wing surface the plane has a low wing loading, which, combined with the strong engine, aircraft characteristics and control surface design result in benign flight handling qualities and high flight mechanical performance. A widely used model design technique was chosen for the cell: the hull is made of glass and carbon fiber reinforced plastic, wings and tail are composed of glass fiber reinforced styrofoam-obeche-sandwich. To ensure safe operation, a safety concept was developed which allows the pilot taking control of the aircraft via RF remote control at any time. This allows critical sections of the flight, such as take-off and landing, to be carried out by the pilot and to test the flight control system at a safe altitude. If the aircraft does not respond as expected, the pilot can take control, recover and land the airplane safely. When the flight control system is mature enough to perform automatic take-offs and landings, the pilot remains in the loop as an observer and additional safeguard for unexpected events. Since the aircraft cannot perceive its environment and, for example cannot circumnavigate obstacles, such a concept is imperative for the operation of UAVs in Germany. Looking only at the size and the weight of the aircraft, the impression could be that it is just a model airplane with an unusual configuration. The differences are the features that allow automatic flight. Those features are a flight control computer (FCC), extensive sensors and actuators. The hardware can be divided into three parts: a flight control system (red), which controls the aircraft in automatic flight, a remote control system (green), via this system a pilot can control the aircraft and a ground station (blue) with radio link to the aircraft, which allows monitoring and controlling the system during flight. Furthermore, a payload (e.g. camera) with a radio link to the ground station is scheduled. In general, the payload will be operated independently from the flight control system. However, it is also possible to develop payloads that communicate with the FCC. The switching between automatic flight control and remote control system described in the safety concept is done via the switch, a proprietary component connected to FCC and remote control receiver. With a toggle switch on the remote control transmitter the pilot can select whether he or the FCC commands actuators and the engine. The flight control system controls the aircraft in automatic flight. The core of the system is the flight control computer (FCC). ADVANTECH provides the project 3.5" single board computers type PCM-9375 and expansion cards type PCM 3643 for four further serial ports. 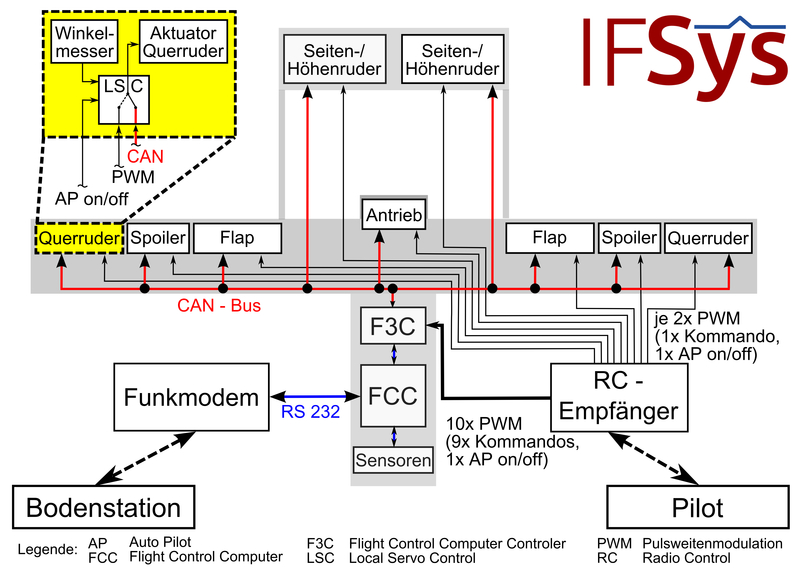 Thus, sufficient interfaces are available to easily connect all sensors installed in the aircraft and a radio modem for communication with the ground station. Windows XPe was chosen as operating system. It was developed specifically for embedded PC applications and is particularly suitable for use in a student project due to the familiarity that students have with Windows. Four onboard sensors provide the relevant data for flight control. They are a GPS receiver that determines position and height, an AHRS (Attitude Heading Reference System) that determines the attitude, rotation rates and acceleration of the aircraft, a proprietary air data system (ADS) with a Prandtl probe for airspeed and static pressure and a four hole probe that determines air flow angles, and an ultrasound height device (US height) that measures the exact height above ground up to 6 m. This is especially important for take-off and landing, where the accuracy of the height calculated by the GPS is not sufficient. The flight control algorithms running on the FCC use the measured data to calculate the appropriate actuator commands, which are used to deflect the rudders and control the electric engine. The flight control software was developed in MATLAB/Simulink®. C code was generated from the Simulink block diagrams with Real Time Workshop Embedded Coder. The remote control system allows a pilot to use a RF remote control transmitter and its corresponding receiver to control the aircraft manually. The receiver operates in the 2.4GHz band, which is common for RC airplane models. It has 10 channels. Eight channels are used to control the rudders, one channel controls the electric motor and the remaining channel is used for toggling between automatic and manual control. There are three separate power supply circuits in the fully equipped prototype. One for the engine, one for the flight control system and one for the remote control system. The engine draws its power from two 4-cell lithium polymer (LiPo) batteries with 5000 mAh connected in series. The flight control system has one 3-cell LiPo battery with 5000 mAh as well as a power inverter, which converts the output voltage of the battery to the 5 V required for most of the sensors and the FCC. The receiver and the actuators are supplied by two 2-cell LiPo batteries with 2100 mAh, which are connected via a splitter. The total mass of these five batteries is 1670 g.
The ground station is used to monitor the flight from the ground. Currently, recorded data are regularly sent to a simple ground station via RF modem. The ground station consists of a laptop with RF modem receiver. The received sensor data (height, speed, position, attitude, etc.) can be read out and analysed. In future, the ground station will be extended by further functions. In addition to the pure display of measured data it will be possible to modify the mission, e.g. by controlling the heading, setting new waypoints, new airspeed or altitude for the aircraft, or to abort the flight and return the aircraft to the runway. In addition, data sent from a payload, such as the images of a camera, are to be received and processed by the ground station. Currently a fully equipped experimental airplane for remote-controlled flights with sensor data recording is available. Successful flight tests were carried out in spring 2011. The UAV was operated from a model airfield with a 110-metre grass runway. To minimize the risk for the hardware, the first flight was performed without the electronic flight control system and thus 2200g less take-off weight. Objective of these flights was to validate handling qualities and rudder rigging and to become acquainted with the flight characteristics. After the successful landing, the flight control computer and sensors were mounted, and the aircraft was flown again. During this second flight sensor data was recorded on the FCC for the first time and the system proved its functionality under real flight conditions. More flights in this configuration are to take place to test the system under real-life conditions. A flight test program will be carried out, in which flight performance parameters will be measured, such as minimum speed with and without extended flaps, maximum rate of climb or maximum speed in horizontal flight. The test flights showed that the aircraft has very benign flight characteristics. With extended flaps it can be flown very slowly, which is important especially during take-off and landing. Concerns about carrying a payload of up to one kilogram mass do therefore not exist. Before automatic flights will be made, the flight control functions that are developed in MATLAB/Simulink are subjected to extensive testing. Firstly, Software in-the-Loop testing (SiL) is carried out. For those tests, the flight control software is integrated into a flight simulation. The flight control software receives simulated sensor values from a 6 degree-of-freedom flight simulation. With those sensor data as an input, it calculates control commands that are fed into the actuator models, which generate the control surface deflections that eventually control the aircraft motion. This process allows an extended test of the flight control software with comparatively low effort. To get closer to the real system, hardware is included into the test environment during the next step. This is called Hardware in-the-Loop test (HiL). During HiL tests the flight control algorithms run on the real ADVANTECH FCC. 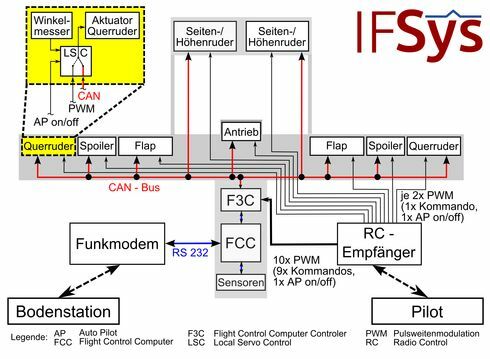 The sensor data is completed by a simulation environment, thus providing sensor input as if the FCC would be on the airborne plane. Thus the system can be tested safely under conditions close to reality. Currently, two more airplanes are under construction. Wings, tail and fuselage are completed as a shell. While maintaining the external shape of the aircraft, there will be hardware and integration changes compared to the first prototype. The additional term “evo” stands for evolution and refers to these changes. In the prototype the flight computer, the individual sensors and voltage converters for each sensor were individually accommodated and wired in the fuselage. This design proved to be relatively prone to electromagnetic interference. Great efforts were made to shield the built-in hardware from each other, so that the range of the remote control system ultimately was sufficient for test flights. Major cause for the interferences was the self-made power supply of the flight control system. Therefore, for the successors a power supply module type ADVANTECH PCM-3910 is used, which is plugged directly onto the computer board. A circuit board is placed in the same casing, which in addition to the function of the switch also takes over the voltage conversion, identifies additional relevant data such as rudder deflections, battery voltage and motor speed and delivers it to the flight computer. This bundling of components promises less cables and a much simpler and faster upgrade of the aircraft, as well as a better shielding from the remote control system through the accommodation in a single casing. At the same time, the space in the fuselage is used more efficiently, so that there is more room for payloads. An example for such a payload is a camera that captures the terrain below the aircraft. As an abstraction of a sea rescue mission, in which the UAV delivers aerial photos and thus supports rescue teams in finding distressed persons, one could add the objective of finding a red crate of beer in a green meadow to the very basic mission defined at the start of the project. IFSys and its modular system offer a wide range of research activities for interested students. For example the aircraft can be used as a platform to accommodate different payloads, or innovative flight control concepts using different sensor technologies can be implemented. And everything can be tested not only in simulation, but also in practice. Through their participation in the project, students learn competent handling of embedded systems; they train their team spirit through interdisciplinary cooperation in a group and they get a basic insight into project management.